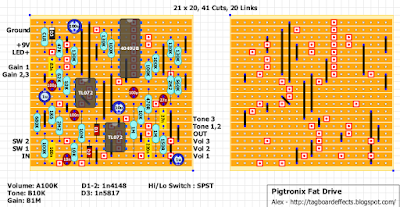 can i use ba4558 Op-Amp for that? Sorry for the late reply mate. You should be fine. The BA part just tells you the manufacturer of the chip. As long as it's 4558, your good to go.There are several manufacturers, such as RC 4558, NJM 4558 or BA 4558. Hi all! Just waiting for some parts before I slap this together. I’ve done the once-over on the layout and I suspect the bridge next to the 8 cuts for the 4049 needs to extend one row north... as it is, it moves from pin 7 to pin 11 (input to input) and pin 6 (the output) goes nowhere. 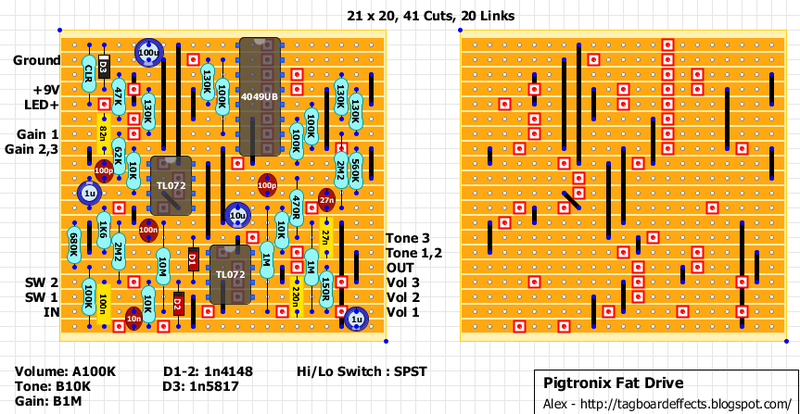 Thanks for the layout Alex, I can’t wait to hear this working. Verified! Haven’t played with it much yet, but definitely delivers what it promises.